The S&P500 opened with strong gains Tuesday morning following overnight stability in China, Europe, and the oil markets. But the comfort of a rebound was short-lived as we slid more than 30-points from the early highs. Only a late surge prevented us from closing deep in the red. While a lot that could be said about Tuesday’s price-action, it has already been superseded by plunging S&P500 futures in Asia’s Wednesday morning trade. We don’t have to look far to find the usual suspect; oil slipped another 2.5% and is now under $28 for February delivery. Counting this overnight weakness, we find ourselves down nearly 14% from last year’s highs. While this feels terrifying, where does this rate historically? Over the last 65-years the S&P500 has fallen more than 10% twenty-times, or about once every three-years. Losses of more than 15% occurred eleven-times, meaning nearly half of all 10% selloffs never made it past 15%. But if we pass 15%, things don’t look as rosy because nine-times we shot straight through 20%. What does this historical data tell us? That selloffs between 10% and 15% tend to bounce while those that exceed 15% tend to keep going. While at first this phenomena seems perplexing, it actually makes sense when we look at the makeup of market participants. We can segment stock owners into two groups, those that follow the market closely and those that don’t. Sentiment measures that include AAII, Stocktwits, option buyers and sellers, newsletter writers, and all the other popularly quoted sources tell us the opinions of active participants. These people tend to trade more frequently and drive daily market moves. A 10% selloff will push the sentiment of the active owners into the cellar where more often than not capitulation selling results in a rebound. But occasionally the panic and fear mongering achieves such intensity that Wall Street’s dirty laundry reaches Main Street. Losses above 15% is when we start waking up a whole new segment of owners and this larger supply allows the oversold condition to intensify. Currently we find ourselves just above this inflection point. Drop a few more percent and we risk Main Street joining in this circle-jerk selloff. Does this mean current owners should get out now while they still have a chance? Not necessarily. It all depends on timeframe. Nimble day-traders and swing-traders who are good at spotting capitulation can profit from near-term weakness and the inevitable rebound, but most everyone else should be thinking about buying this dip, not selling it. The other thing that history tells us is only three of the nine 20%+ selloffs were under 20% for more than a few weeks or months. While we sliced through 20%, we bounced back nearly as quickly six out of the nine-times. The odds are clearly more in favor of buying these discounts than selling them. But what about those other three-times? I suppose each of us must decide of this oil weakness is a one-in-twenty selloff that completely trashes our financial system. We saw prolonged losses from the 1970’s stagflation and oil embargo. Then there was the grossly overheated tech bubble that came crashing down. And lastly the housing bubble where the most valuable asset people owned plunged in value. If you think a slowing China and falling oil prices ranks up there with the worst financial calamities of the last 65-years, then you should be selling. But if you have a less fatalistic view of the world and our economy, then this is just another buyable dip on our way higher. While it is never easy to hold through volatility, the time to sell was when the first cracks started forming, not now that we are approaching a capitulation. I told my subscribers on January 4th that the price-action was deteriorating and I moved to cash. Now a couple of weeks later I’m on the verge of buying this weakness. If people want to sell me stock at a steep discount, I’m more than happy to oblige them. Their loss is my gain. 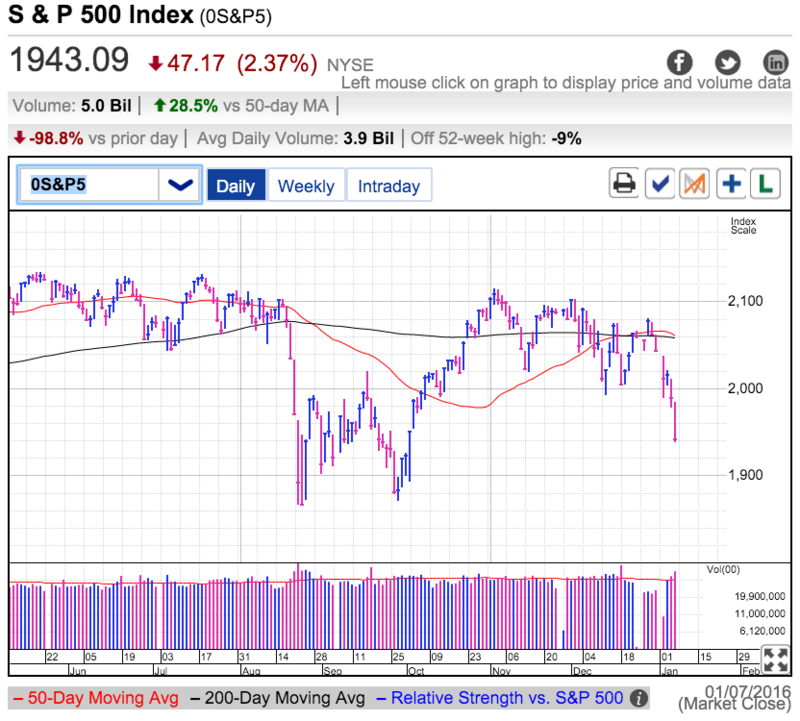 Thursday was a good day for the S&P500 as it recovered a big chunk of Wednesday’s bloodbath. While we are still struggling to make headway, this was the third up-day out of the last four. How you interpret this price-action largely depends on your biases, but it is a notable change from last week’s relentless selling. This also marks the seventh consecutive day of above average volume. Thursday’s trade reached the highest levels since December’s options expiration and September’s option expiration before that. Clearly a lot of people were paying attention and trading this volatile session. The weekly AAII sentiment survey revealed optimism is at the lowest levels in over a decade while pessimism reached multi-year highs. In this historically bullish survey, bears outnumber bulls by whopping 250%. Anyone claiming the market is overly bullish is delusional with confirmation bias because they clearly don’t see everyone running around with their hair on fire. While we might not be at the bottom yet, this dramatic swing in sentiment and huge volume means we are getting close. The last time we saw this much volume was back when August’s selloff was bottoming. The only thing moving this market is the price of oil. Does this make sense? No, but this is how the crowd is thinking and thus the only thing that matters. But with each passing day and tic lower, we are shedding owners who fear falling oil and replacing them with buyers who don’t mind cheap oil. Maybe these calm buyers realize oil production represents less than 1% of U.S. GDP. Maybe they are experienced investors who know these stories always come and go. Remember the Bird Flu pandemic? No? What about the Fiscal Cliff? Sequester? Taper? US debt downgrade? This tells you just how big of a deal most of these things turn out to be. But oil isn’t the only thing scaring investors. We have a strong dollar and slowing global growth that will allegedly crush our exporters. But the thing is all our exports together only represent 13% of GDP and only 5% of that demand comes from Asia. While knocking off a few percentage points won’t help our sluggish recovery, it certainly won’t cripple our largely self-centered, service and consumption based economy either. But the market never lets common sense get in the way of a good stampede for the exits. There are two ways to trade the stock market. Buy at a premium and sell at a discount. Or buy the discounts and sell them later at a premium. Just like any successful business, buy at wholesale and sell at retail. Just think about that when you are tempted to join the emotional sellers. There has never been a dip in the history of the stock market that wasn’t buyable and this one is no different. The S&P500 managed to finish in the green for the second day following last week’s brutal kickoff to 2016. In just over a week we erased 150-points as a struggling China and plunging oil reignited fears of a global slowdown and financial contagion. Similar headlines triggered August’s 10% correction and the sequel proved nearly as damaging. The question on everyone’s mind is if this is the capitulation bottom or just a dead-cat bounce on our way lower. Oil briefly slipped under $30 Tuesday for the first time in over a decade. Only a few months ago predictions of $30 oil were met with skepticism and ridicule, but the market has a nasty habit of pushing us to the “obscene number” before the crowd capitulates. Thirty-dollars was that obscene number and we finally tagged it following a nearly two-week free fall. But just when it seems like there is no end in sight, we run out of sellers and bounce. That happen today when the market rebounded almost immediately after flirting with the high $20s. This modest rebound in oil was enough to lift the S&P500 off the intraday lows, allowing us to finish just under 1,940. And the party is continuing in the overnight futures markets with the S&P500 up another 15-points in Asia. At the very least we should expect a few day bounce as the market recovers from a near-term oversold condition. Expect this scramble to push us back to 2,000 resistance. From there we will see if short-squeezing and chasing transitions to real buying. Or if we stall continue the global slowdown selloff. The key to surviving this market is trading proactively. Take profits often and don’t get married to a position because it will likely reverse days later. Be pragmatic, not dogmatic. It’s been a brutal week for the S&P500 as we experienced one of the worst starts to a year in market history. We’ve fallen 140-points from last week’s highs as traders continue to be terrorized by Chinese uncertainty. We’re down five out of the last six sessions while Chinese regulators have suspended trade twice this week due to selloffs exceeding 7%. Given this turmoil it is no surprise to see AAII’s sentiment survey approach historic levels of pessimism. If we take trading cues from the crowd, clearly this is the best time to panic and dump stocks at steep discounts before the selloff gets worse. But since I make money trading against the crowd, I am looking at this move in a far different way. We’ve only closed under 1,950 a handful of times since 2014. If we view risk as a function of height, buying and owning stocks here is one of the least risky times to be invested in over a year. While it certainly doesn’t feel safe, I’m sure most would agree buying and holding stocks today is a far better idea than buying and holding them last week. Everyone knows we are supposed to buy when people are fearful and sell when they are greedy, but that is far harder to do. When the crowd is running scared and our trading screen is filled with red, it is way too easy to succumb to the crowd’s seduction. In Friday morning trade the Chinese stock market is holding up relatively well after their government unwound some the currency moves that unnerved markets. This bumped their market and halted what could have been another day of relentless selling. They also abandoned the ill-conceived 7% percent circuit breaker that exacerbated recent volatility. Together these have been enough to at least temporarily delay another wave of panic driven selling. As a result US and European futures are higher in sympathy. Assuming China can hold it together for the rest of the trading day, the next big event is the US monthly employment report. Normally this is a headline event, but it has been forced to the back pages as global volatility dominated the financial media’s attention. The most important thing to remember is the S&P500 responds to US corporate sales and earnings, not Chinese. If our recovery continues to chug along despite Chinese weakness, our stock market do the same. China has been slowing for over a year and no one believes the overly optimistic economic growth numbers the communist government is putting out. If China weakness was going to take us down, it would have happened by now. The US is largely a self-centered, consumer and services based economy. Our vulnerability to a Chinese slowdown is far more limited than an export dependent economy like Germany. And the proof will be in the pudding. Another strong US employment report Friday morning will show these Chinese and oil fears are overblown. Soon traders will shift their focus from these global-macro distractions to the actual performance of our economy as demonstrated by employment and fourth quarter earnings. While it’s been a lot of fun following the Chinese and oil markets the last few weeks, it is time to get down to business and focus on the things that really matter when determining stock prices.